For a business as manufactured and suspect as the idol industry we sure do see a lot of well-crafted anime surrounding it. Of all the ones I’ve seen I found The iDOLM@STER to stand above the rest of the pack, bringing together an ensemble of incredibly talented animators to create a work filled with endearing subtlety and tons and tons of engaging vignettes and little narratives. The iDOLM@STER Movie is essentially cut from the same cloth, a continuation of all the little things that made the original series great in an extended feature-length format. The biggest thing of note is how generally lowkey The iDOLM@STER Movie is for a big feature-length production. It does have a few bombastic sequences – including its glorious opening scene featuring a ridiculous fantasy blockbuster starring the idols – but on the whole it’s a fairly mellow affair. And that actually works for the film in building a down-to-earth narrative across its two hour run time. 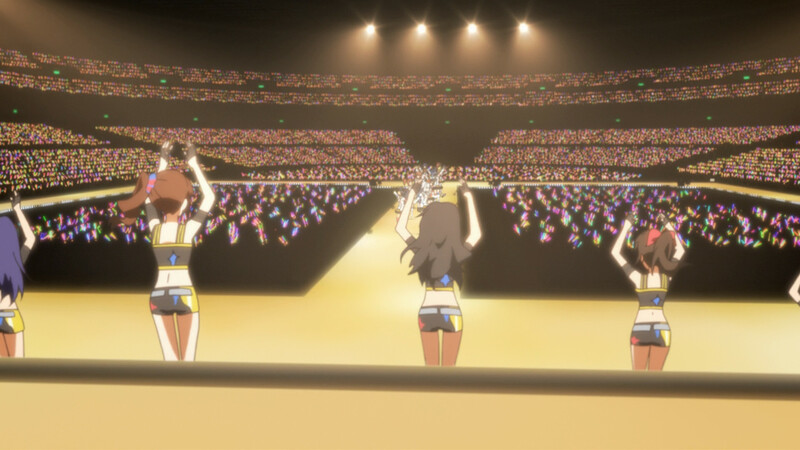 The main narrative we see is of the 765 Production idols collaborating with a group of rookie idols for their first big arena show, which the film builds off of with plenty of grace. The rookie idols reflect the growth of the main cast by acting much the same way as they did at the beginning of the original series, and through their interactions we see the main cast act as mentors taking responsibility for them and trying to pass on the lessons they’ve learned. Haruka in particular is faced with the struggle of proving how far she’s come, acting as de-facto leader of the group and faced with the task of connecting with the similarly anxious and klutzy Kana Yabuki. Sources of conflict with the 765 idols, such as Miki’s jealousy at Haruka being leader of the group, are easily resolved through straightforward communication and shared trust in one another. By contrast the rookie idols are still learning what it means to be a part of an ensemble group, and beyond that what it means to be a public figure under media scrutiny. The issues arising from these things tend to come in smaller conflicts of priorities and personalities, the most significant being Shiho’s self-centered work ethic clashing against Kana’s difficulty coping with stress. These conflicts are authentic and never overstated, developing in subtle ways across the events of the film before eventually reaching a satisfying resolution wherein the rookie idols come to terms with working together. Whereas some idol shows like Love Live! opt for pure spectacle and other idol shows like Shonen Hollywood opt for grounded storytelling iDOLM@STER tends to sit at the intersection. It’s filled with plenty of wonderful ridiculous things, but the way it tends to tell it visually is multilayered in a quite dignified way. 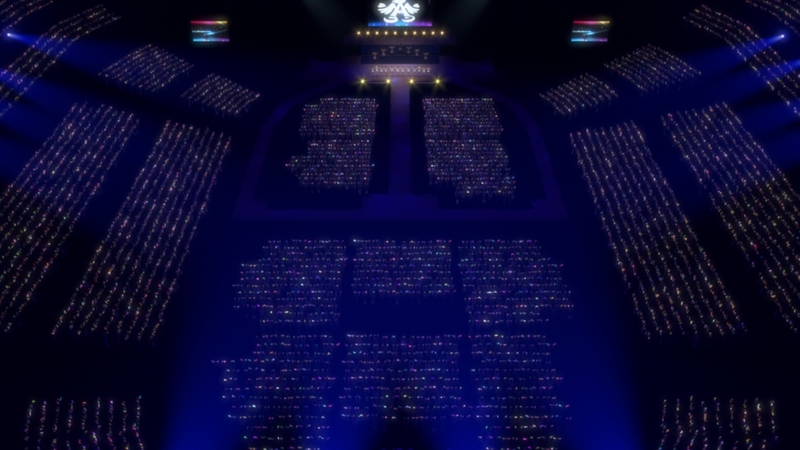 Throughout The iDOLM@STER Movie this tends to show in the tight but beautifully expressive framing of serious dramatic scenes, but the true culmination of both the seriousness and the joy of The iDOLM@STER movie comes in the final performance scene. The choreography of the performance interspersed with the fluidity of its animation are truly stunning, and the way the shot composition combines narrow and wide shots from a variety of different angles demonstrates the scope of the arena in spectacular detail. It tells you that this really is the big one, that this is what 26 episodes and a two hour film were building up to. 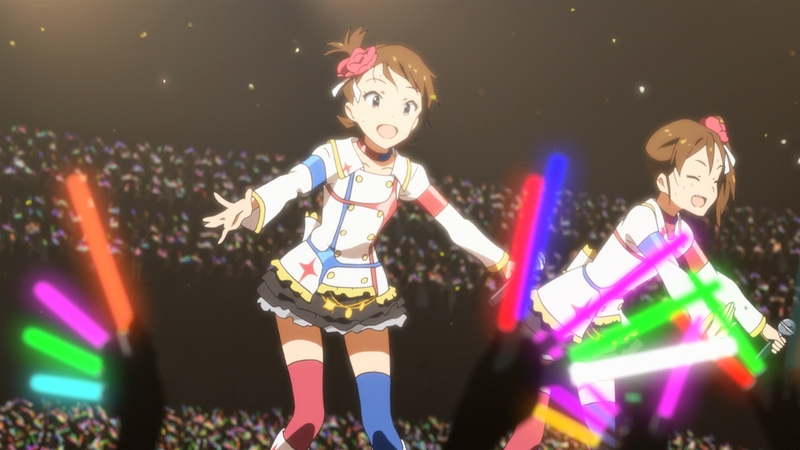 On the whole The iDOLM@STER Movie is an absolute treat for fans of the original series. It’s a production brimming with talent telling a satisfying mostly grounded story, accented with a couple spectacular silly moments and a big cathartic climax. Its peaks aren’t as high as those of the series it originates from, but it’s simply a good film and a good sequel. Shine on you crazy idols!